8 posts categorized "Making art"
Now through September 15, 2014, the Books about Town public art exhibit takes place all over London. Wild in Art, who is partnering with National Literacy Trust to put this on, has art education initiatives that engage students on issues both in their immediate and worldwide communities. UK artists donated their time and talents to create these benches; check out the Instagram account to see how they look out and about. My latest article about new media, technology and the U.S. presidential elections is now live as part of The Huffington Post's ground-level election coverage, OffTheBus. 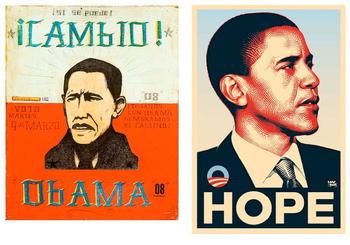 A group of visual artists are mobilizing for Barack Obama, and his campaign has shown an appreciation for and understanding of artists, designers, and other creative types. In doing so, it has reached out to groups usually ignored by most presidential candidates (and most national-level politicians, in general). A fascinating aspect of these artists' support of Obama is that they are sharing posters, t-shirts, buttons and prints that they've created using new media and technology — via Web sites and blogs — thereby attaining mass reach. No matter who you support in this election, it's fascinating to see one way a candidate is building a voting base using Internet-based tools. To read more about this unique combination of art, technology and politics, click here. My article includes interviews with some of the artists and organizers behind these works, Web sites and online communities. It's getting interesting feedback and comments already; check it out — you may want to join in the conversation. UPDATE: This article is now cross-posted at techPresident. tP's motto is "How the candidates are using the Web, and how the Web is using them." If you're interested in tech and politics, 2008 is truly unlike any previous election year because of the Web, and techPresident is following it all. Put some time aside and get ready to read their relevant, timely site. Nostalgic for zines? Make one now! I made my first zine when I was 8 years old. Seriously. It was a not-for-profit publication with a small circulation, entirely self-published, and hand-written and -drawn. My brother (who was 6 years old) and I, not being aware of zine culture at that time, called it a "newspaper". It had some writing (done by me), some drawing (done by me and my brother), and an advertisement (also done by us). We created the advertiser ourselves. It was called "Boop Drink", a mixture of lime and grape juices. We made the drink in our kitchen, then plugged it shamelessly through a full-page ad on the back of the newspaper, and tried to get our parents to buy it and drink it. They did. Successful advertising and a family publishing dynasty — yeah! 1. After weeks of procrastinating, we staff members would pull an all-nighter in the computer center, station ourselves on as many Macs as we could snag, dose up on double-stuff Oreos and Coca-Cola, and write and draw and giggle and yawn and drink more soda and write and draw some more until the sun came up. Our deadline — 8AM, when the campus photocopy center opened. 3. In a few days, we'd have 500 free copies to distribute throughout dorms, academic buildings and the student center. We'd drop these off in locations ourselves. We worked on this publication, which closed when all of us graduated, for three giddy, caffeinated years. I still miss that intensely creative and silly time. Anything completely ridiculous was possible. So when I saw this (thanks, Smith! ), I had to share it. I've now added "making a zine" to my long list of still-to-do projects. One glorious day, I now know I'll make another zine. I'll post when I do. Write to "The Envelope Collective"
The Envelope Collective is an ongoing collaborative experiment in art that uses the transportation of mail as a medium. 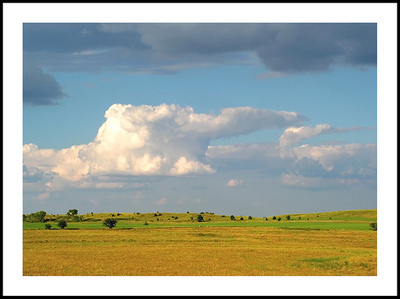 The website is an online gallery for those pieces that we receive. What can you send them? If you need more ideas or just want to see what others have sent in, view the gallery. On the EC site, you can also chat about mail art with other "mail fine artistes" in the forums. If you have any additional questions, especially about how to send the EC your mail art, read their FAQ. I'm having fun thinking about what the postal employees who deliver their mail see every day. Are the Envelope Collective addresses on the most desired mail routes — or the most dreaded? How do the mail-sorting machines deal with all the sculpture-like envelopes? Making mistakes can be good for your creativity and productivity. Really, I mean it — this is not an April Fool's Day joke. Eventually, we're going to make mistakes, especially if we takes risks in our art and writing and blaze new trails. Why not flip their negatives and get as much positive as we can out of them when they happen? Fill the well by making art. So that's what I'm doing: finger paints, clay, collage, crayons — I'll go where my art muse will take me. It will be silly and unstructured. It will be unpredictable. It will be FUN. I will post any insights I discover about the creative process. If I make anything beautiful or interesting, I will post it, too. 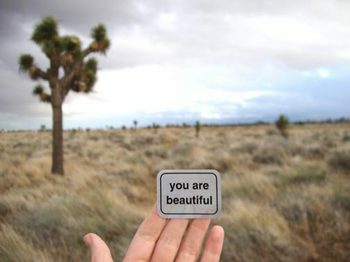 Check out my post over at PSFK about the inspiring "You Are Beautiful" art project. YOU draw the cover of these books. Imagine buying a book. Its cover is left blank intentionally — so that YOU can create it yourself. This now exists. Penguin Books has launched My Penguin: Books by the Greats, Covers by You. This new line features six classic books. See a picture of Jane Austen's Emma at left, one of the series. Yes, that's really what it looks like! My Penguin invites those who have created a cover to email them a jpeg of it. The reader-created covers are then posted in an online gallery for all to see. What a creative idea! This could be an effective way to help students feel much more personally connected to their required-reading literature texts. Creating the cover, whether by drawing or collaging or painting, could be part of a student assignment. I like the inter-disciplinary possibilities. Thanks to psfk for the tip.